Barely an hour’s drive from home, Bowman Bay was the hiking destination today. Once there, I could not resist first walking to the end of the pier to have a good look around before setting off for the two trails that go around Lighthouse Point and Lottie Point. 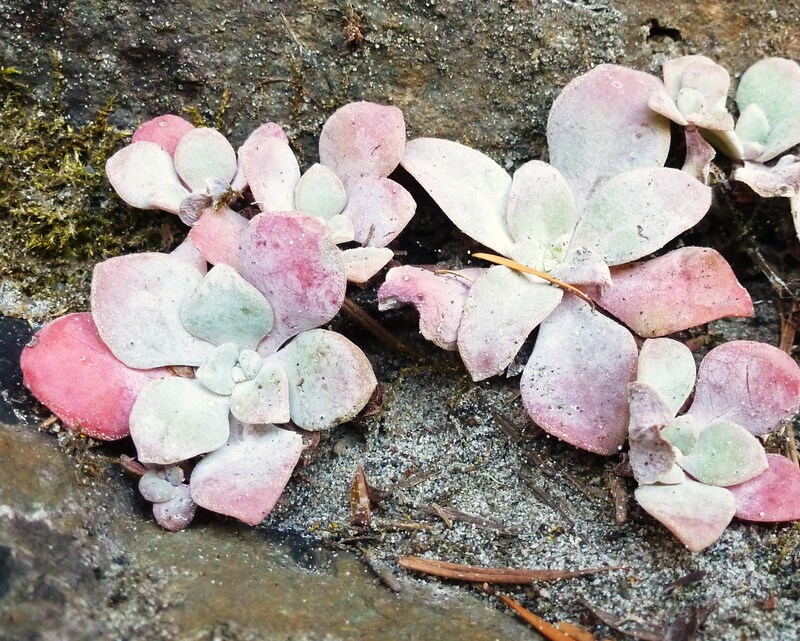 As if to show that Spring is just around the corner, these lovely pink and pale green succulents were growing on the rock cliffs below Lighthouse Point along the sandy tombolo that connects Bowman Bay to Lighthouse Point. 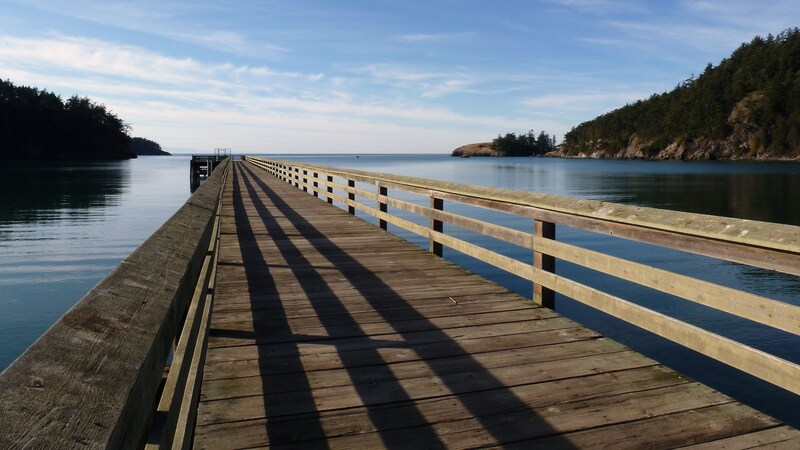 The loop trail around Lighthouse Point cuts through a forested area and then offers wonderful views of Deception Pass, the San Juan Islands and Cascade Mountains to the West from its high cliff trail. Before the main trail takes you up high again onto the cliffs, there is a short trail leading down to the beach. 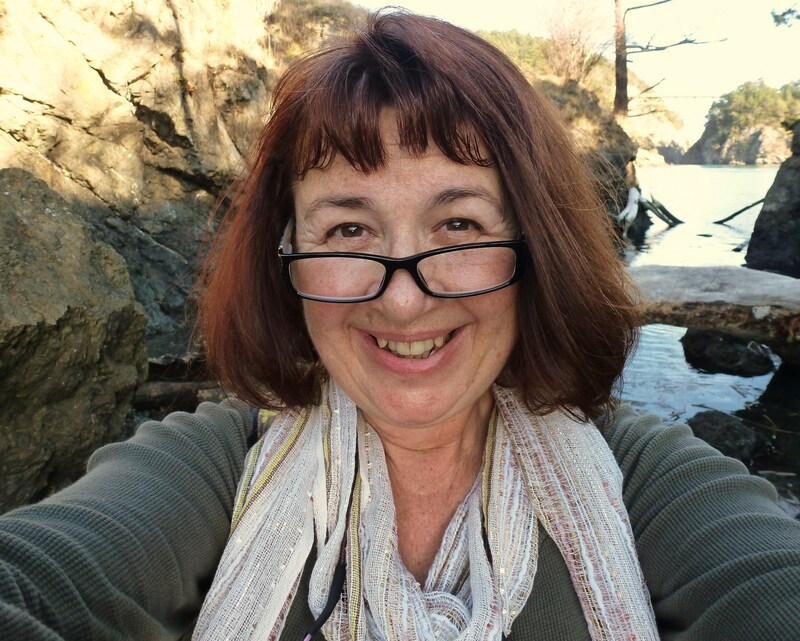 I admit it, I love to walk beaches, and couldn’t resist – here I am, on the beach. On the beach below Lighthouse Point . . .
After thoroughly exploring all the trails at Lighthouse Point, I crossed the tombolo once again and connected with the trail to Lottie Point. 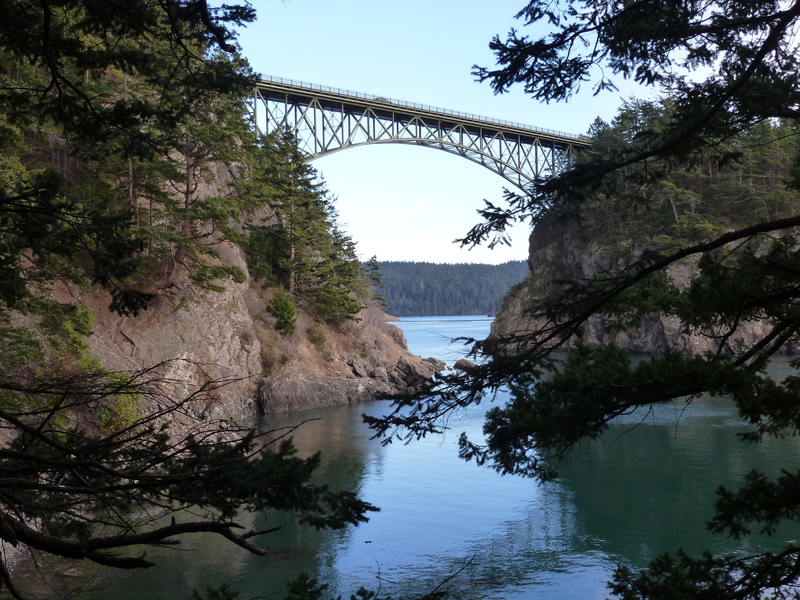 A shorter, but just as spectacular in view type of trail as that around Lighthouse Point, again there was a great view of the Deception Pass Bridge. After completing both the Lighthouse Point and Lottie Point loop trails and spending plenty of time combing the beach, I walked through the picnic and camping area of Bowman Bay. 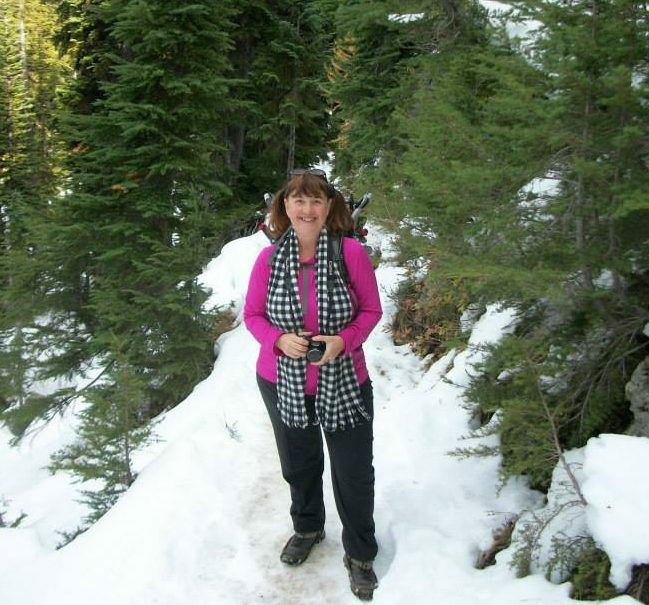 With plenty more trails, beaches and lakes there at Deception Pass Park yet to explore – Pass Lake, Sharpe Point, Rosario Head, Rosario Beach, North Beach, Goose Rock, Hoypus Point and more, I am sure I will be back very soon. 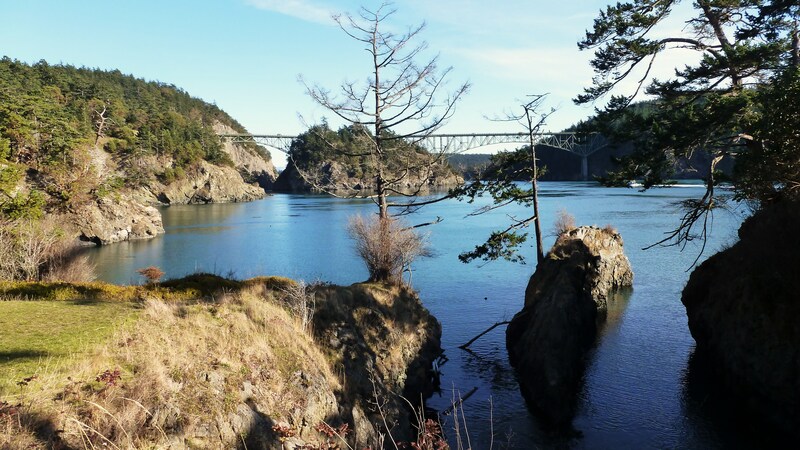 Part of Deception Pass Park, what an absolutely lovely location to camp, picnic and hike! 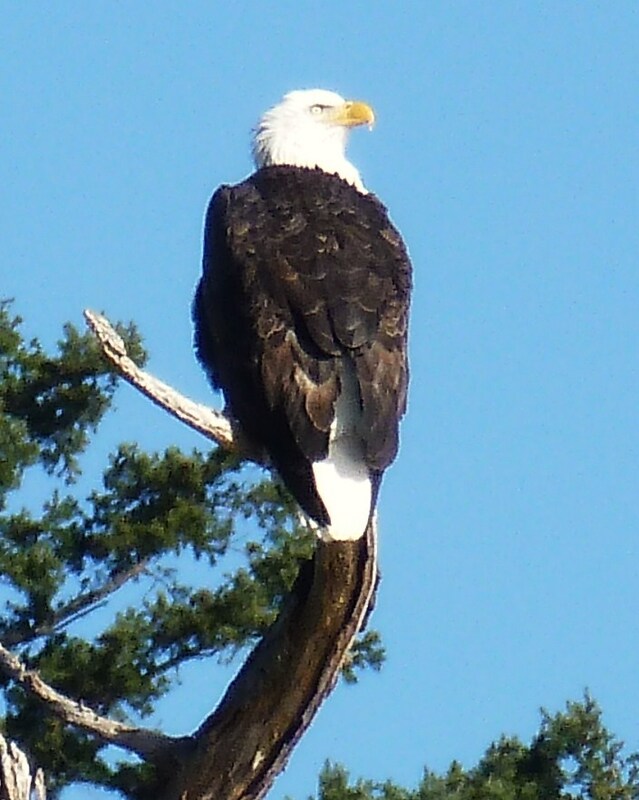 One of the highlights of today’s hike, this bald eagle perched in a tree between Lighthouse Point and Deception Pass. How absolutely spectacular to watch as it took off in flight from that perch and soared across the pass.